We export PTFE Teflon coated cables to all over the world. We are leading manufacturer of Induction heating cables. of O.08mm (nom.) and to be covered 100%. Owning to our experts experience in this domain we are capable of exporting and manufacturing quality range of PTFE Insulated High Temperature Cables. These are made using superior quality raw materials and are processed under sophisticated technologies. Moreover our products are tested on certain parameters under the supervision of our professional experts to ensure its quality. We offer these cables at cost effective ranges. 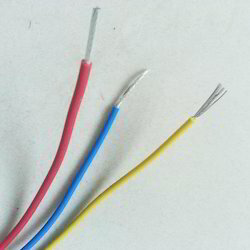 We are counted amongst renowned & trusted names in offering wide range of PTFE Ignition Wires. Our organization holds expertise in offering a wide range of optimum qualityIgnition Cables to our valuable customers. Available with us at highly affordable market prices, these cables are widely used for the purpose of conducting the voltage to the spark plug of various automobiles. Owing to the long function life, minimum voltage loss and optimum performance, these cables are highly demanded in the market. This wire is broadly utilized for electric fitting as a part of different commercial enterprises. Produced by our persevering experts by making utilization of the premium quality crude material, offered wire is accessible in fluctuated limits according to the particular necessities of the customers. Further, we give this wire at temperate costs to the customers. PTFE Wires, cables are tape wrapped wires having uniform insulation thickness around the central conductor compared to the wires insulated by extrusion process. PTFE is higher grade insulating polymer compared to other fluorocarbons that are used in extrusion process. PTFE Wires, cables have much greater perfection. We are counted amongst one of the noted suppliers and manufactures of Sensor Cables. We carefully manufacture these cable using high grade raw material and modern technologies. These are available in various sizes, length and thickness. We sell these cables to our customers at market leading rates together with best services within the stipulated time period. 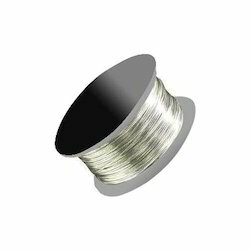 PTFE Coated Silver Wire-This wire is manufactured using optimum grade silicon with the help of high-tech techniques in compliance with set industry norms. Moreover, it is checked for its quality on series of quality parameters before being supplied to our clients. Clients can avail this wire from us at pocket friendly price. We are counted amongst renowned & trusted names in offering wide range of PTFE Multipair Cable.